A drizzle of orange glaze and sprinkle of hazelnuts to top them off and give them that extra something. Oh Thanksgiving, the time of year where we go completely INSANE for one day of binge eating. Us Americans really do it right! But in all seriousness, it’s basically the Superbowl for foodies, am I right? Days and weeks of preparation for the perfect desserts, sides and appetizers. Gathering all your closest friends and family to celebrate nothing other than FRIENDSHIP. It really is the quintessential holiday. Like most holidays, tradition comes into play heavily! Beware, anything you start in 2018, be ready to continue for the next 10 years (especially those with kids). We introduced our kids to the Macy’s Thanksgiving Day parade a few years ago. It was one of their first experiences watching live TV, including all those brainwashing commercials. 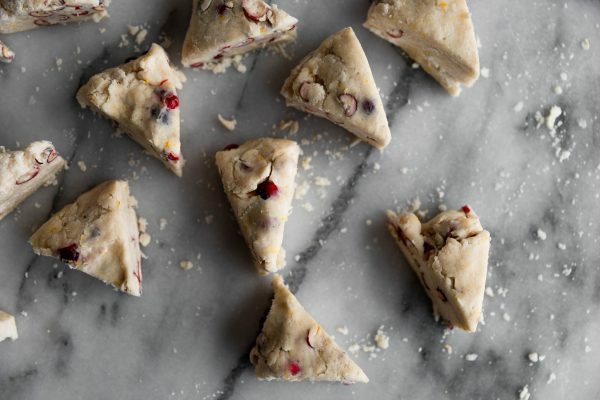 I happened to make some Cranberry Orange Scones for something to nosh on before our 10 course meal later that night. Fast forward a few year later, guess what my kids do every Thanksgiving? Yup, watch the Macy’s Thanksgiving Day parade and nosh on Cranberry Orange Scones. Who am I to mess with tradition? Tender, flaky and cranberry orange goodness! Perfect for your holiday table. These simple scones come together rather easily and quickly, but the best part is you can prepare them days even a few weeks ahead of time. 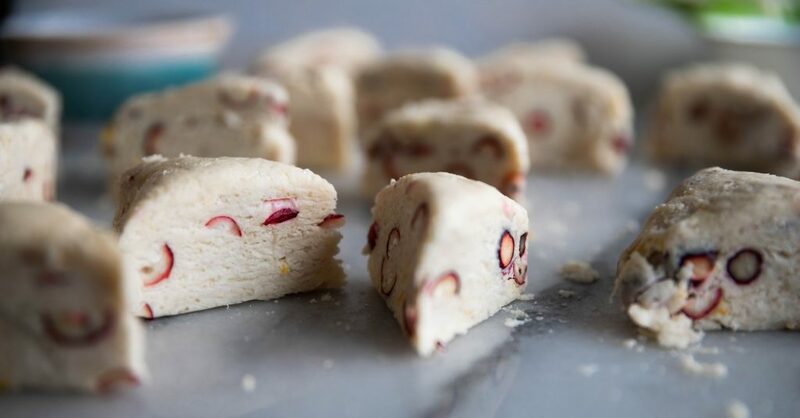 Making them ahead and popping them into the freezer will make you a STAR Thanksgiving morning. It’s also one less thing to worry about preparing. 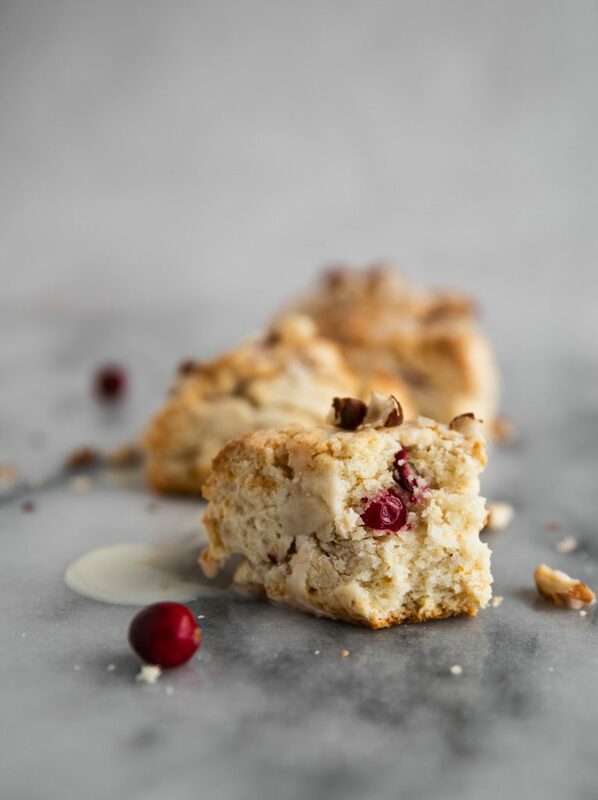 Fresh cranberries are the star of this scone, with fragrant hints of orange and flaky layers they’re sure to be a hit! One bowl, a few tools and you’re ready to create magic in the kitchen. 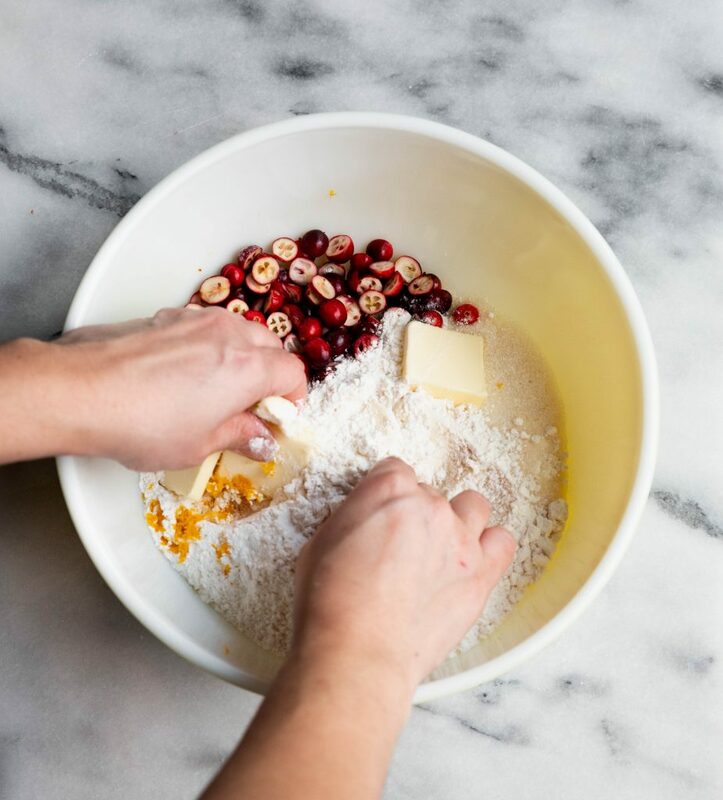 Once mixing your dry ingredients together, work the few tablespoons of butter together between your fingers or with a pastry cutter. Pour in your heavy cream (aka liquid gold) and mix together gently until a shaggy dough forms. 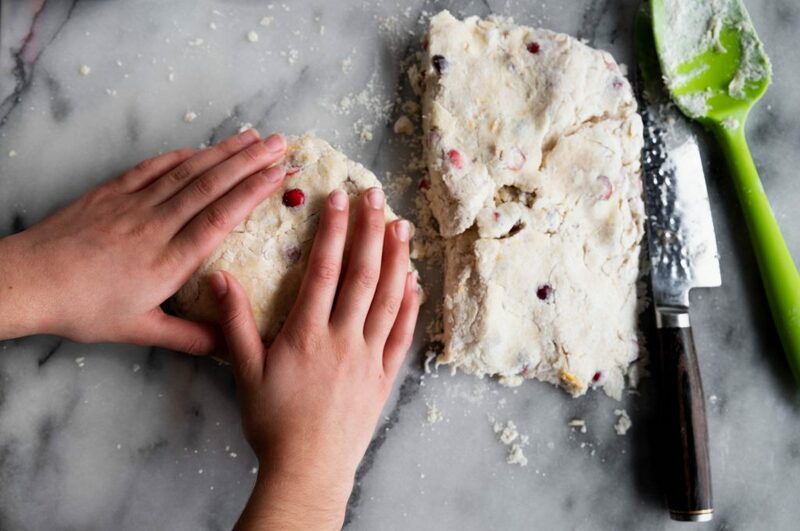 Dump onto a clean surface and work your dough gently into a rectangle, fold over a few times gathering all the loose dough bits to incorporate. Once a solid dough forms, cut in half then shape each half into a round about 1.5″ thick. Cut into 6 pieces for each circle for smaller scones. Place on your prepared baking sheet (parchment or silicone lined) and pop into the freezer or bake immediately. After baking, allow to cool and drizzle the delicious orange glaze on top for a perfect morning treat. Whatever your Holiday traditions, wishing you the best and most festive! As always, I love seeing your creations! Tag me on Instagram or Facebook for a chance to be featured in my stories! 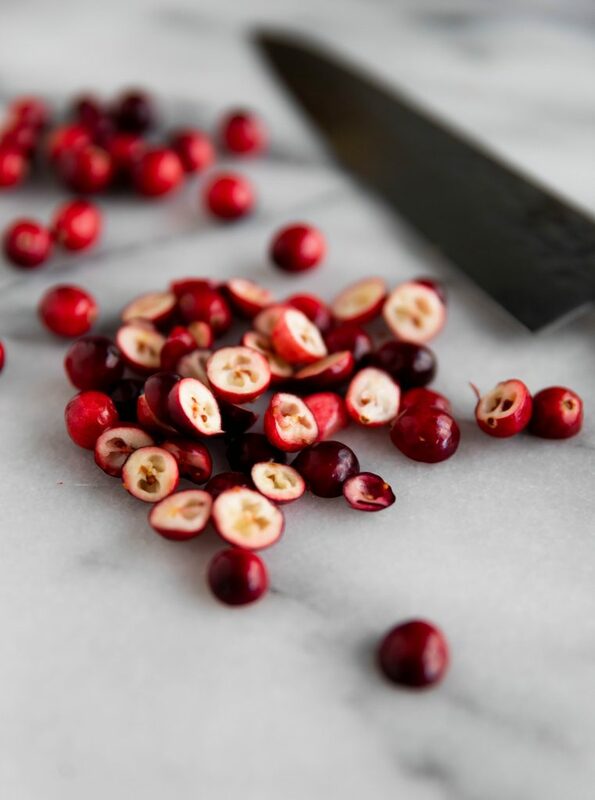 Fresh cranberries are naturally tart, a little sugar and butter help create something delicious. Combine the butter into your dry ingredients until little pebbles form. Heavy cream makes these scones ANYTHING but dry! Use your hands to form 2 circles then cut into triangles. The height on these scones make them sooooo tender and flaky! In a medium bowl, whisk together flour, baking powder, salt, and sugar. Cut in butter and work into small crumbles with pastry cutter or fingertips. Add in cranberries, zest and gently toss together. In a liquid measuring cup mix together vanilla extract and 1 1/3 cups cream. 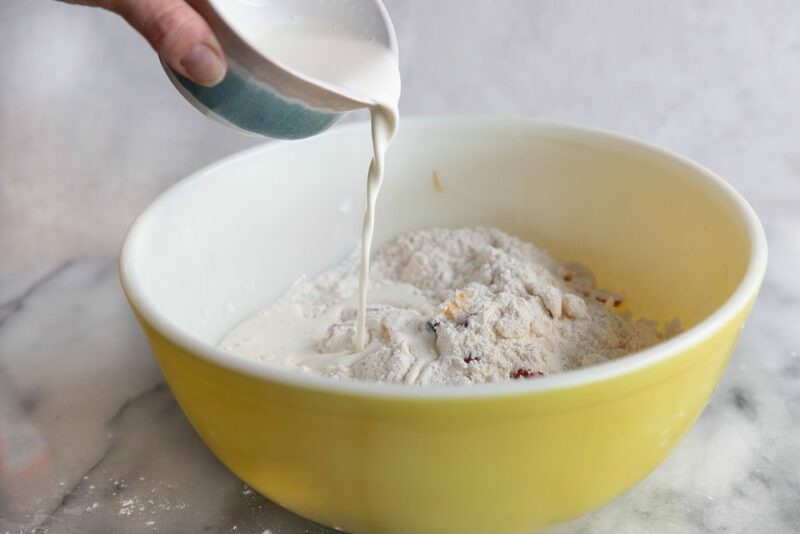 Drizzle the cream mixture into the flour mixture, tossing gently until a cohesive dough forms. Add 2-3 more tablespoons of cream if necessary to create a moist, cohesive, but not sticky dough. Place 1-inch apart on the prepared baking sheet and bake for 18-20 minutes or until golden brown and cooked through (best to bake 1 tray at a time, if you can't, swap trays at the halfway point to ensure even baking and browning on top). Remove from the oven and transfer to cooling rack. Make glaze, whisk powdered sugar and juice until a smooth glaze forms. Drizzle on top of cooled scones, top with hazelnuts if you like. **Make ahead. Go through all the steps for scones except baking. Once you have cut scones, you can freeze on the baking sheet until form then toss them into a zip lock bag. 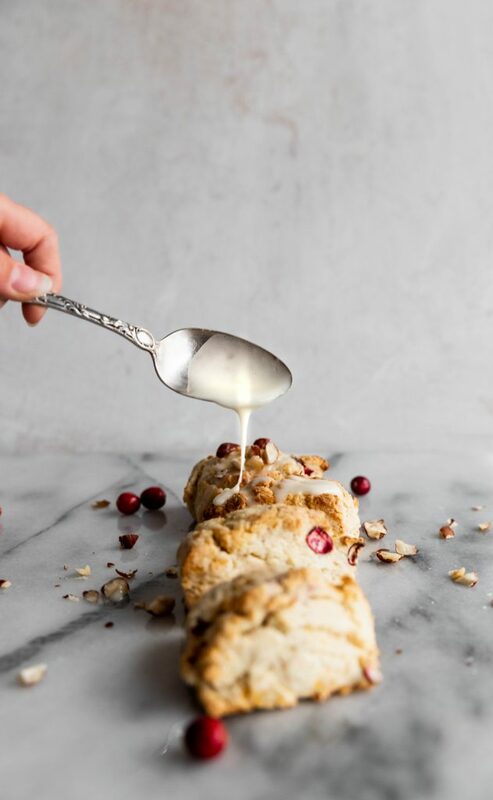 Anytime you want a fresh scone, pop into the oven and glaze! Great before the holidays!